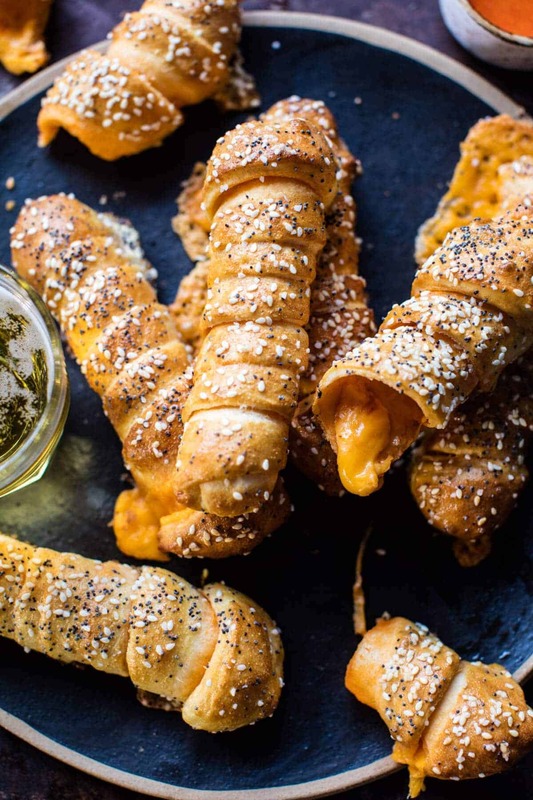 Buffalo Cheddar Soft Pretzel Twists with Everything Spice. Could there be a better combo then buffalo cheddar…and pretzels?! I mean, for something like the Super Bowl…I’m thinking no. 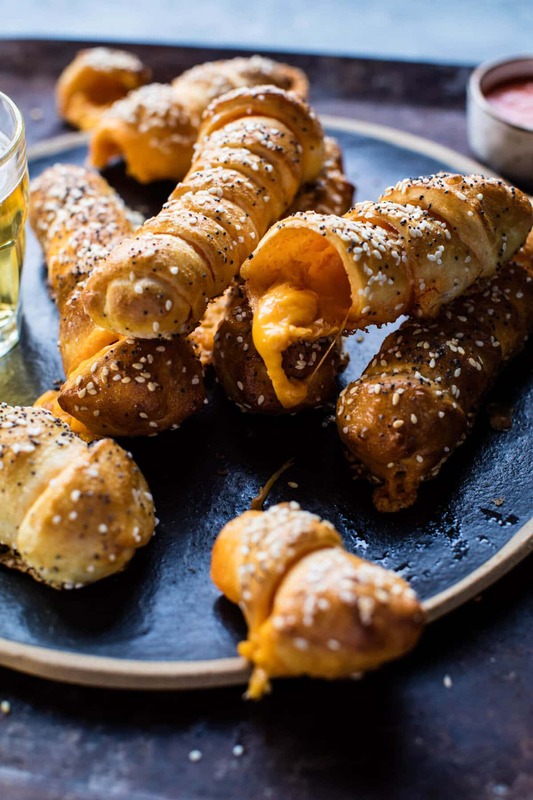 Plus all game day festivities need at least one buffalo dish, and this year, these buffalo cheddar soft pretzel twists are on my list. Think soft pretzel, meets cheese, meets buffalo sauce…all topped with everything bagel spice. It may seem like a lot, but it’s actually just the best thing ever, and the everything spice is like the icing on the cake, totally the best! Whoaaaa. 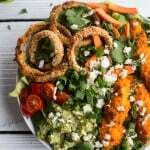 That is a lot of buffalo sauce recipes…and that’s not even all of them. 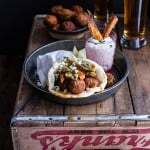 If you’re curious about the other recipes I didn’t list here, just search buffalo in the search bar…but be prepared for a serious buffalo overload. So ahh, anyway, I think the point is that buffalo sauce is very well received over here. I’m not really sure how these pretzels came into my head, but somehow an idea for cheesy breadsticks turned into these soft pretzels. At first I actually set out to make breadsticks full of cheese and garlic. Of course they were going to be delicious and all, but then I totally just messed them up. Or well, I messed up the way they looked…they tasted great! But something went wrong when I was shaping the breadsticks, and well, let’s just say it was not a good look. Normally, I would have simply tried again, but the very, very, very white color that the breadsticks were giving off was leaving me highly discouraged to try again. 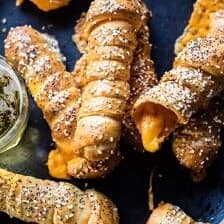 It’s cool though, because this recipe fail is what lead me to the idea to do a little recipe mix and match and lead me to these pretzel twists instead. Sometimes things like this just happen in my recipe testing world. A lot of times the recipe just needs to be reworked, but sometimes…it just needs to be thrown away. Then there are other times that a mess-up leads to the creation of an even better recipe, fortunately, that’s the case here today. Honestly, I don’t think any breadstick could even stand a chance against these pretzels. They’re salty, cheesy, spicy perfection! 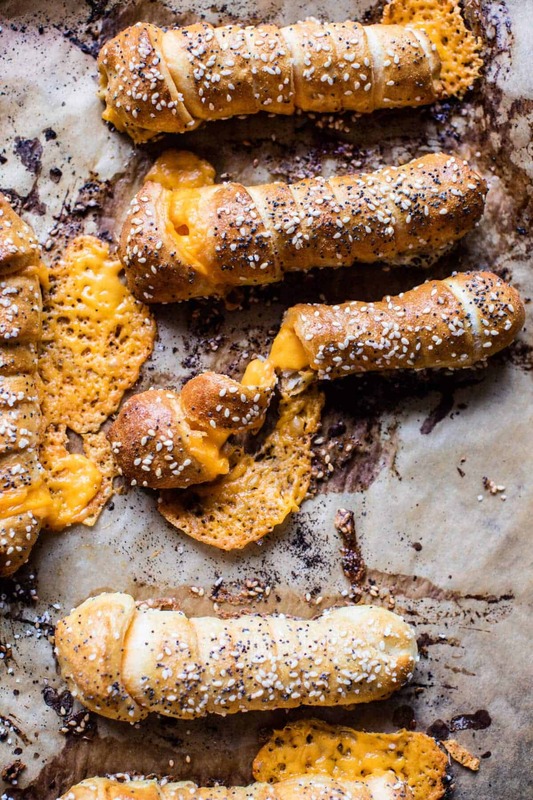 While they might not seem simple, these pretzels are actually pretty easy to make. Just start out with basic soft pretzel dough, but instead of shaping the dough into a pretzel, roll it out like you would a cinnamon roll and spread it with buffalo sauce. 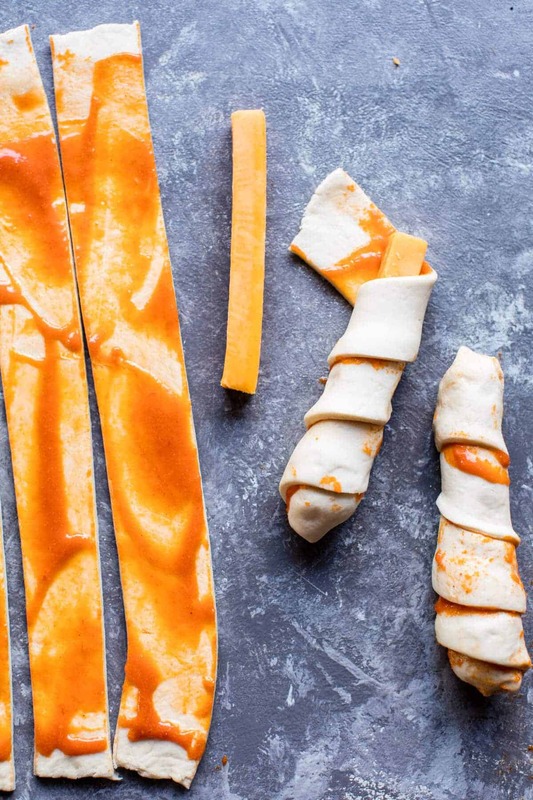 From here, simply cut the dough into long strips and wrap it around a stick of cheddar cheese. And as if they aren’t already amazing enough, the pretzels are then topped with a sprinkle of everything spice. 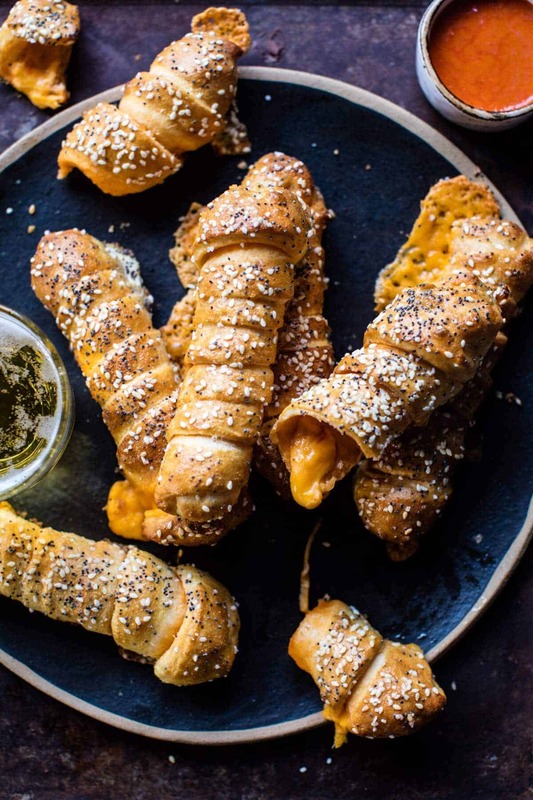 Even if you’re not into watching the Super Bowl, these pretzel twists are pretty much snack heaven. Perfect for weekend parties, after school snacking and pretty much everything and anything in between. Like maybe a little Tuesday cheesy goodness? Thinking that might be a great idea. <–do it. PS. I brought the leftovers to X-Games with me over the weekend and even cold, these disappeared within seconds. PSS. I forgot to thank you all for all of your kind words and positive vibes for Red. He did great and while it wasn’t his best day, he still had a blast doing it! Could there be a better combo then buffalo cheddar...and pretzels?! Combine the water, brown sugar and yeast in the bowl of a stand mixer and mix with the dough hook until combined. Let sit for 5 minutes. Add the melted butter, 1 1/2 teaspoons kosher salt and the all-purpose flour to the mixture and mix on low speed until combined. Increase the speed to medium and continue kneading until the dough is smooth and begins to pull away from the sides of the bowl, about 3 to 4 minutes. If the dough appears too wet, add additional flour, 1 tablespoon at a time. 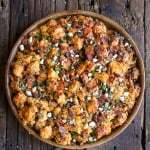 Remove the dough from the bowl and coat the bowl with olive oil, add the dough and turn to coat. Cover with plastic wrap and place in a warm spot until the dough doubles in size, about 1 hour. Preheat the oven to 425 degrees F. Bring a large pot of water to a boil and add the baking soda. Remove the dough from the bowl and place on a flat surface. Divide the dough in half and roll into a rectangle about 1/4 inch thick. Spread the dough with a little buffalo sauce. Cut the dough widthwise into 6-8 strips about 1/2 inch wide. 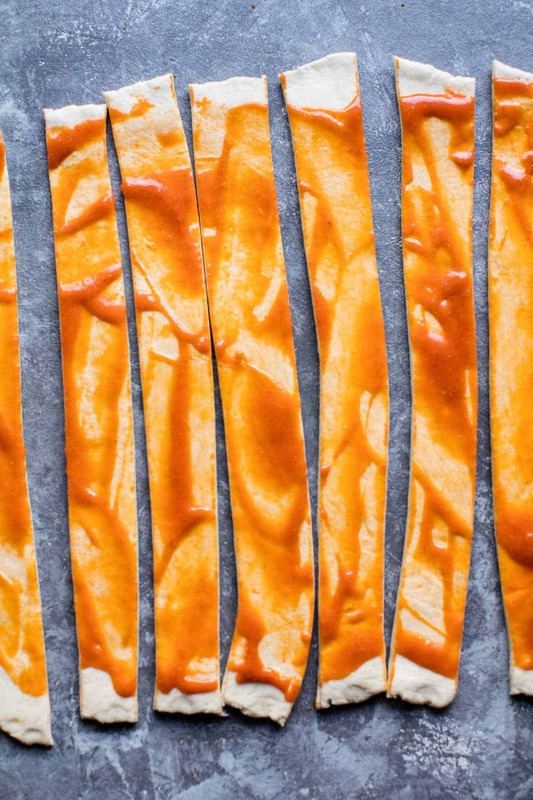 Wrap the dough around the cheese sticks with the buffalo sauce side facing inward. Seal at both ends. Boil the pretzels in the baking soda water, 1-2 at a time for 30 seconds. Remove with a large flat slotted spatula or a spider. Place 8 pretzels on each baking sheet, brush the tops with the egg wash.
For real though? the cheese inside? with the buffalo sauce? SO GOOD. Wow! What a brilliant idea. Omg, Tieghan! These pretzels! And all that cheese oozing out. I seriously cannot wait to try these! Yes, yes! Hope you love them Andrea! These look amazing! I’m going to need these in my life this weekend. Thanks Kellie! Hope you love them! Yum! I am such a sucker for pretzels! Oh my gosh! Same. they’re to good! So many flavors calling to me at once! Ah yes!! SO happy you like it girl! Thank you! Could these be more fun?? I think not. Will try these for sure! 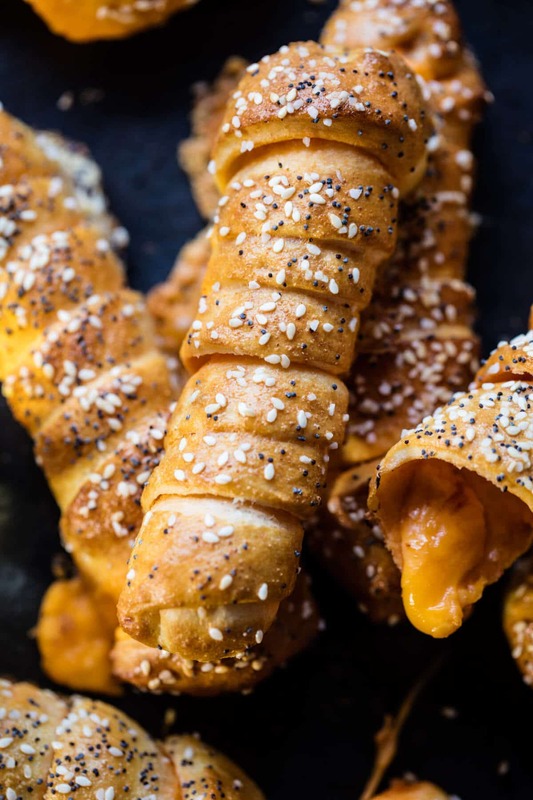 I just love these, pretzel twists are the best! Ah yes, and I love buffalo so these were A favorite of mine! Thanks Laura. Hey Gia! Hmm, I am really not sure without know how you made them. Did you change anything about the recipe? Sorry for the trouble. Hope I can help! Ah, yay. How perfect! I hope everyone loves them!! 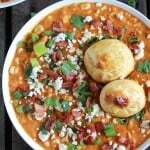 Very nice dish, cannot wait to have it. Not sure if I can make it as yummy. You totally can make it as yummy! Thanks Shubham! I made these! I’d like to make them again because they were sooo yummy, but they definitely did not turn out looking like yours, so I was wondering if you have any tips on wrapping the cheese with the dough so they keep their shape? The dough unraveled/fell apart when I put them in the boiling water. thanks in advance! Agreed. It doesn’t get any better than this! I visit daily a few sites and information sites to read articles, except this weblog provides quality based articles. Can you freeze these after baking? If so for how long and what is the reheating proccess? I followed the recipe except subbing whole wheat for half of the flour. They still turned out soft and delicious. Thanks for a great recipe! I am so glad you liked these Suzanne! Thank you! I feel like I already know the answer is no, but wanted to check just in case as these look amazing. Is a stand mixer necessary? Can I put in a little bit more time and elbow to make this work? Thanks so much. I may just have to buy a stand mixer. I made these for a galentines and they were a hit! I froze them the night before, before blanching them. The next day I let thaw for about an hour and then got to work and they came out perfect!